Whether you’re a busy office that needs to be able to fill out your name and address quickly or a home filled with busy financial transactions, this name and address stamp can simplify your life and make it easier than ever to include all the information you need on all of your transactions. 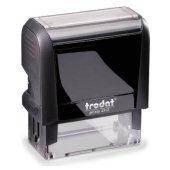 This self-inking stamp can be used over and over again with no need to re-ink; you’ll get thousands of impressions before you have to worry about finding a new source of ink. Standard: stamp: Size is 2 5/8” x 1 1/8” and has a print area of 13/16” x 2 ¼”, which allows 4 lines of information. Large Stamp: Size is 3 1/8” x 1 5/16” and has a print area of 15/16” x 2 11/16”, which allows 6 lines of information.